IRA always has something to offer in the way of understanding the world of education. This year more than any other, it concentrated on trying to make sense of — or as I kept hearing, “unpack”– the Common Core State Standards. The implementation of the CCSS was on everyone’s mind. The fact that IRA advertised over 50 sessions that were all about the standards spoke highly to that. Also, getting into many of those sessions was almost impossible. Sometimes there would be 300 hundred seats, all filled, half an hour before the session. I think it says that while teachers know they need to use these standards to set practices, they just aren’t quite sure about them. The other part of the standards is that I didn’t hear much about the final assessments. No one quite knows what they will look like. These were the questions that seemed foremost in the minds of those I spoke with. Although no one has absolute answers, they are good food for thought. Here they are: How are the CCSS taking shape in your school? Are you busy seeking new materials? Are you re-evaluating what you have so you can see where some of what you already do will fit? What are you doing to get your kids ready for assessments? Do you have any idea how those will look in your state? I am starting to see lots of information about the “flipped classroom.” This has grown out of the Kahn model, which was talked about at the TED (Technology, Entertainment, and Design) conference. Here’s a link to learn more about TED and the Flipped Classroom. How much time does it take to prepare the videos that kids need to watch? Does this span every grade level? Or where should you start with this model? What if there is no computer in the student’s home to watch? What goes into the video? It is just a teacher talking, is it clips that make things clearer to the kids? How much “set design” do you have to do to make kids pay attention? Here’s a link to a teacher, Mike Gorman, at 21st Education Technology and Learning. He is also starting to think like this. There is some good information here. Obviously I am in the nascent stages of learning about the flipped classroom. But I find the whole concept fascinating. How about you? What do you already know that you can share? Do you find yourself slogging through book reports that your students write? I remember thinking if I had to read one more paper with plodding sentences I was going to throw up. . . or at least throw the papers across the room. But then something occurred to me. I was assigning those ridiculous book reports. You know the ones. Read a book and write a 2-page summary. Make sure to include the high points of the story. Tell what you liked best about it. Oh yes, that makes for scintillating reading, doesn’t it? I’m not sure when I wised up to this, but it might have been about the time that Los Angles Unified published their own book called Scrip and Scrippage. Even the name had an amazing ring to it. What ever did Scrip and Scrippage mean? I still don’t know. This book, now over 30 years old, still holds a place of honor on my bookshelf. It’s an 11 ½” x 8” book, so it’s oblong. It has a soft brown cover, brown ink on beige paper. It evokes memories of change for me. For no longer did kids have to do rote reports to let me know they had read the book they were reporting on. They could choose from a dozen fabulous projects. Each one included detailed directions. They also included more than writing. Sometimes art was involved, or math, or social studies. The reports were often cross-curricular. Some of my favorites were the projects that had the students. . .
• create personalized stationery and then write a letter from the protagonist describing a significant incident in the book. The kids would go crazy for this project. The stationery inspired them to write wonderful descriptions. The project is just as valid today, especially since the stationery can now be created on a computer. • combine poetry and summary-writing skills. Kids had to create a diamante poem about one of the characters. It was quite a task to get that description down to 16 words. These kids had always written very long summaries, so this was a good way for them to learn to edit themselves. • complete an employment application for one of the main characters in the book. I used to have my students use this when they read animal stories. I would have them fill this application out as if they were one of the animals. Some of my more creative students would do things like use animal paw prints for the applicant signature line. There are many types of creative book reports. There are lots of sources on the web. 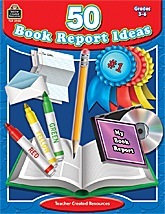 TCR publishes 50 Book Report Ideas (TCR 3948) filled with many creative ideas. Do yourself a favor. Find a new way for kids to express what they have learned so that you can take joy in reading what they have to say. After lunch my kids used to come barreling into the classroom. They had wolfed down lunches and then run off to play basketball or gossip among themselves. They came into class sweaty and chatty. They would throw their backpacks down, grab their books, pens and papers, and sprawl in their chairs. How would I ever get them to focus after lunch when they really wanted to continue that basketball game? So here’s what I did. You might want to try this, it was easy and it worked. I read aloud to them. I picked up a good old-fashioned book, and took the first few precious minutes of the class to read. Some might question this. After all it wasn’t getting them right to work, they weren’t being engaged in an assignment. But to that I say, phooey. They were getting to hear a story, one that I knew would captivate them. As 7th graders they wouldn’t pick up books that they thought sounded “babyish.” But if the teacher was reading a book to them they had to listen didn’t they? My students hadn’t had lots of exposure to the bigger world so I tried to find things they could enjoy. One of my favorites was Old Yeller. Of course it was what Jim Trelease, author of The Read-Aloud Handbook, would call a “cry book.” At the end of the book there was always a few students with their heads down on the desk, tears dripping from their eyes. I found the best way to handle that was to not. I just let them cry. If they wanted to talk about it later we did so privately and individually. Another kind of story the kids liked were those that were a bit absurd. I remember reading James and the Giant Peach. Any time I read a book I planned where I would stop each time. However, with this book we all got carried away. I almost finished it the first time I read it aloud to a class. To be that enthralled by a book sometimes makes it okay to just read aloud for an hour. For a group of particularly challenged learners I read the first of the Little House books by Laura Ingalls Wilder. With these I had to spend a lot of time talking about vocabulary before I began reading. While it might seem simple, most of my students were second language learners, so it took a lot to help them understand. But they did enjoy the books and often asked me to read the next one in the series, which I happily did. If you teach young students no doubt you read to your kids, but what about older ones? I always felt if nothing else the kids could hear a really good book. And it must have worked, as they always calmed down as they listened and enjoyed the story. I had finished reading and we could progress through the rest of the class, focused on whatever the task at hand for the rest of the day.